When it comes to choosing an exercise bike in the mid-price range, you are so spoiled for choice that it can be really difficult to make a decision. The problem is that small benefits can make a big difference when every bike is broadly the same. The Viavito Satori looks elegant, has all the main features you would expect for the money, and seems to benefit from a strong consumer review base. But is that the whole story, or does this exercise bike suffer from issues that mean that it won’t be a good performer? A feature which often gets overlooked on an exercise bike is the seat. Many suffer from having hard seats which generate consumer complaints. One feature of this exercise bike is that the manufacturer actively mentions that this product comes with a large, soft and adjustable padded seat. It certainly feels the part, being very padded and well constructed compared to some we have reviewed. You certainly get a feel for the build quality of this exercise bike when you unpack it. All the parts feel heavy and strong, and are well finished as well. Competent assembly should take a single person less than an hour. Two people should be able to build it in around half an hour, this is good by the standards of construction for exercise bikes. Everything fits together well, and there were very few adjustments to be made after assembly was complete. Apart from looking very sleek and stylish, in use, this exercise bike is fantastic quality for the money. One of the first things you should look for in an exercise bike is the amount of resistance levels, and the heaviness of the flywheel. If the top resistance level is not high enough, and the flywheel is light then as soon as you are fit the exercise bike will not up your heartbeat and push you further. The Viavito Satori Exercise Bike does not disappoint in use. There are a huge 32 levels of magnetic resistance available, far more than on other similarly priced models we have seen. This allows you to subtly increase resistance as your fitness increases. The 9 kg flywheel in conjunction with the subtle levels of resistance creates a good range of exercise peaks, even for the intermediate user. This is certainly not on exercise bike that will desert you as soon as you are fit. In use it is very quiet and very sturdy. It has a very small footprint but this does not make it unstable. 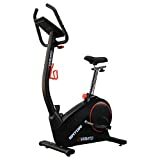 What really sets the Viavito Satori Exercise Bike apart many others in the mid-price range is the quality of the digital console. For a start the 32 levels of magnetic resistance are controlled through the control panel, no awkward dials to turn on the body of the exercise bike here. The display can cycle through the basic information, and can display speed, RPM, distance, calories used, current pulse, all in big and easy to read, crystal clear digital readout. A feature surprisingly absent from a lot of exercise bikes even in the higher price point is the ability to switch between metric and imperial readouts. You will be delighted to find on the back of the digital console a switch that allows you to change between KM or MI. There are 12 preset programmes, each of which can be set at 16 different levels. Again this exercise bike stands out from others of a similar price in that you can about your weight and age to tailor the programmes and outputs. There is even a WATT control program present. Although this is usually only used by people under medical supervision, who need to be very specific about the limits of exercise they do, its presence shows that the Viavito Satori Exercise Bike has been well calibrated to allow the feature. This exercise bike has a very small footprint, which makes it easy to push into a corner for storage. There are two very solid transport wheels which makes it easy to lift and move as well. We would say however that as it is 30 kg, finding a permanent space you can exercise in will be far easier than moving it each time you want to get on it. In conclusion we have to say that this is a very high-quality exercise bike for the money. So for us, the conclusion of this review is that the Viavito Satori Exercise Bike is certainly one you should be considering if you are looking for a mid-price range exercise bike. The fact this exercise bike is so comprehensive in terms of how you can develop, that it has a comfortable seat, high quality console that can be tailored individually, and that it can cope with people up to 22 stone in weight, makes it one to consider for anyone interested in getting fit on a budget. A similar model to the Viavito Satori is the Roger Black Platinum which you can see by simply Clicking Here.